A lightning-filled squall chasing us into Nassau. If you read our logbook for the past two months, it tells a lovely story, island hopping through the Berrys and Exumas. Perfect destinations that evoke turquoise dreams. And that is a true story. If you look at our beautiful photos, the story is a little different. 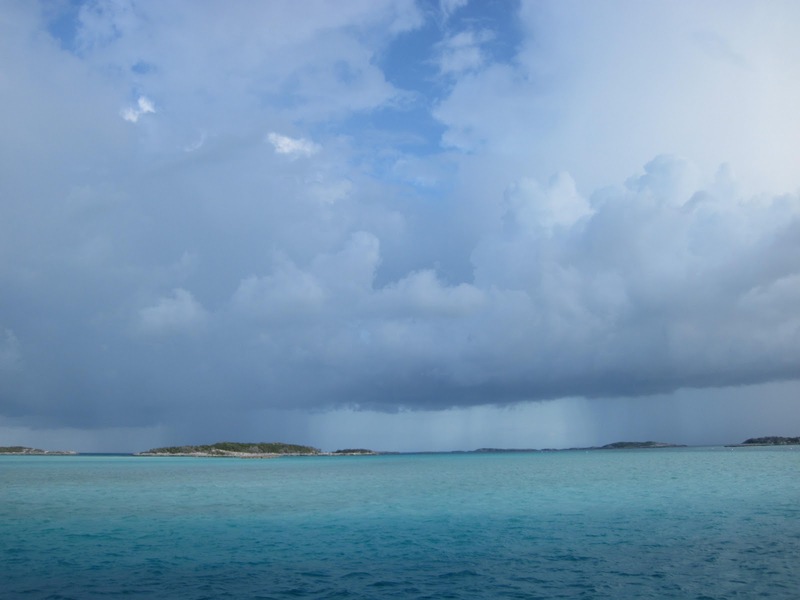 It was a turbulent weather season in the Bahamas this spring, with storm fronts constantly on the move. We had less than 10 days where the weather didn't dictate our movement. We ducked into the all-around protection of Warderick Wells so many times, we started calling the entrance our driveway. Fortunately for us, it's one of our favorite spots in the northern Exumas and offers calm nights and lots of activities no matter the weather. Squall line north of Warderick Wells. The weather gurus kept predicting an end to the storm fronts. 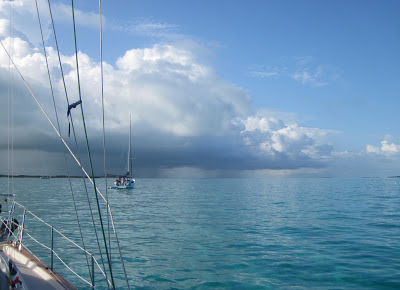 "Next week, we'll start getting settled weather..."
The squall that chased us from Hawksbill to Shroud Cay. We eventually got weary of rolly anchorages and the high stakes running dodge, so we decided to head back to Florida, where it's easier to find protection. On our way from the northern Exumas to Nassau, a squall stalked us. I thought I was outrunning it, but I think it just fell apart. Then on our ride north, the New Providence Channel was all bumpy from gusty wind the day before. On our first attempt at crossing to the U.S., we went north off the bank at Great Harbor and turned back rather than facing unpredicted 20-knot wind and annoying swell. The next day, we sailed west instead of north, across the Bahama Bank in lovely following wind and seas topped by a riot of stars and a bright swath of Milky Way. By dawn, we left the bank and entered a confused Gulf Stream where rolling swell, 4 to 6 feet, came at us from behind and on the starboard side. 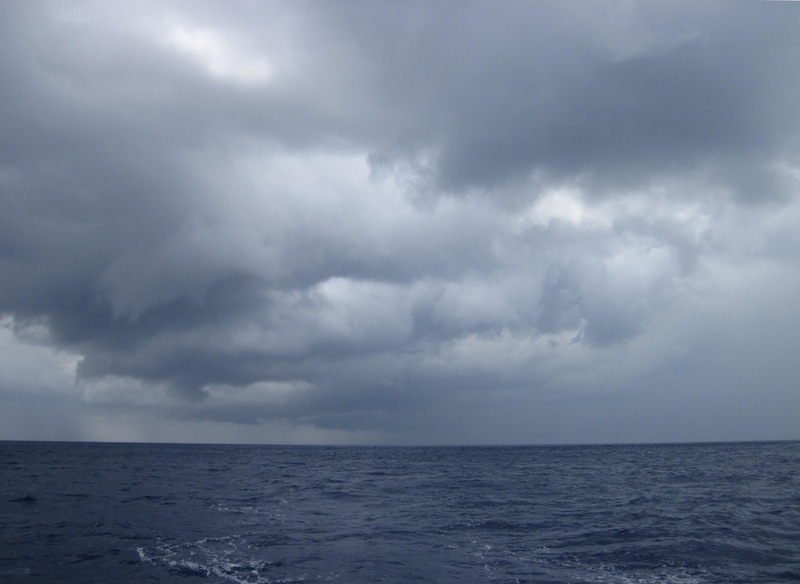 There was not enough wind to keep us stable, but for the Gulf Stream, it was not so bad. As we approached our destination, Lake Worth, the weather reared its head again. Squalls surrounded us on all four sides. 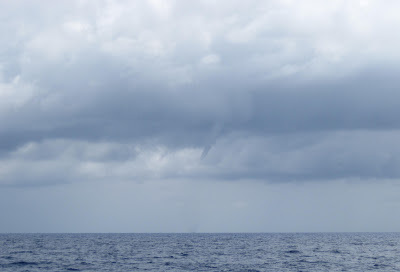 When I looked to starboard and saw a waterspout, I screamed right out loud, "PLEASE, JUST LET US PASS!!!" Waterspout dropping from the clouds. Oddly, old Mom Nature listened. One of the squalls dissipated and the others skittered off. There was but one more bit of weather before we ducked safely into inland waters. 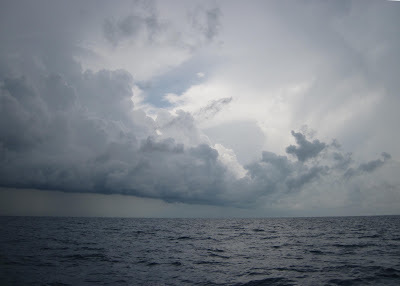 As we came within 10 miles of the Lake Worth Inlet, an offshore squall kicked the wind up from the east. At the inlet it was pushing the water into big 6-foot rollers marching in at short intervals on an incoming tide. Had we missed our target arrival time, the tide would have turned, leaving us to stand off until either the water laid down or the tide turned again. Instead, we rode in at a galloping trot and finally dropped anchor just inside the inlet on a perfectly smooth Lake Worth. We live at Mother Nature's whim, and sometimes she's a harsh mistress. But on her good days, she's such a charmer. She blessed us with many perfect days to explore new islands with friends old and new. Photos to come! One last volley at Great Harbor the night before we left. Does this sort of thing rub off? 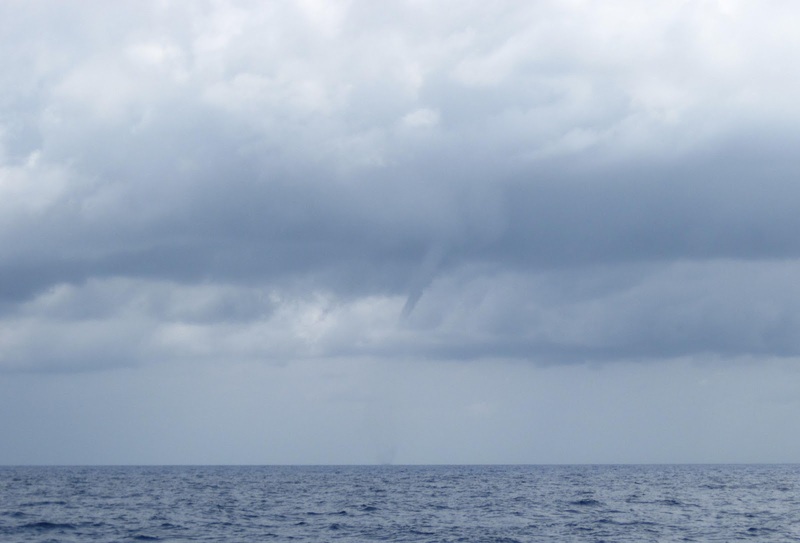 Although we had a great crossing from Bimini the last 15 miles into Lake Worth looked a lot like yours (no waterspouts though). You can see our stormy skies photo at sailblogs.com/member/brogdon. I'm sorry if it does! I'm glad you made it in safely. It's always a relief to get across that cranky Gulf Stream. We are in Annapolis now and just had a huge squall pass over. Seems they are everywhere this year. HOW DID THAT SAILING THING TURN OUT?